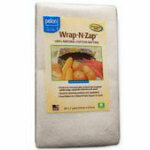 Pellons WrapNZap is a microwave safe product is made of 100 Natural Cotton Batting. It is perfect for use in projects like insulated potato bags, casserole warmers and more. When used in the microwave, it will trap the moisture inside to produce a perfect baked potato or a well steamed ear of corn. It can even be used for warming rolls and tortillas. Color: Natural. Size: 45" x 1yd. NOTE: When working with products intended for use in a microwave, certain precautions should be taken. Use only 100 Cotton batting, thread and fabric. WrapNZap is made of 100 Cotton fibers without any additives. It is not fire retardant or flame proof. For this reason, we suggest cooking in 2 minute intervals for a maximum of 8 minutes. Never leave the microwave unattended. Do not use in a ConvectionMicrowave oven.